Our office is open from 9:00 - 17:00 Monday to Friday. For a list of contact numbers and emails please see our Senior Management page. 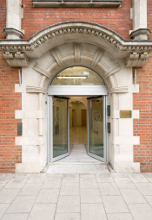 The GOsC is located on the south side of Tower Bridge Road at 176 Tower Bridge Road, London SE1 (between Druid and Tanner Streets). The nearest mainline station is London Bridge, from where it is a 10–15 minute walk. An alternative would be Waterloo station from where it is approximately 15–20 minutes by bus (381/RV1) depending on the traffic. The nearest tube stations are London Bridge (Northern Line, Bank branch & Jubilee Line), which is a 10–15 minute walk away, and Tower Hill (District and Circle lines), from where it is a 15 minute walk. From Waterloo station or Russell Square: the 188 stops in Tower Bridge Road, near the junction with Druid Street, very close to the GOsC offices. From Waterloo & London Bridge stations: the 381 or RV1 stop in Tooley Street, near City Hall. From Tower Hill & Liverpool Street stations the 78: stops in Tower Bridge Road, near the junction with Druid Street, very close to the GOsC offices. From Liverpool Street station: the 42 stops in Tower Bridge Road, near the junction with Druid Street, very close to the GOsC offices. From Victoria station: the C10 stops in Abbey Street near the junction with Bermondsey Street. There are nearby carparks at Snowsfield and Kipling Street (near Guy's Hospital and London Bridge station).